I’m Melanie Johnson, Product Owner for Carer’s Allowance Digital Service. And I’m Jo Clarkson, Delivery Manger also for Carer’s Allowance Digital Service. 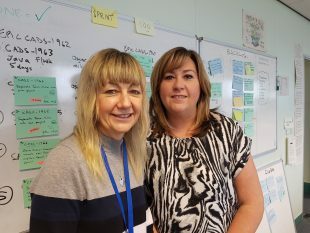 As we work really closely together in developing and delivering this service, we wanted to write a joint blog to highlight that agile really is a team sport. Carer's Allowance Digital Service recently entered its 100th agile sprint, so we thought this was a good time to reflect on what we’ve achieved and share our enthusiasm for what’s coming next. For many people, going ‘live’ with your digital service is the end of the story, but that’s not the case in DWP. All of our digital services are built to meet our ever-evolving users’ needs, so we’re constantly iterating and improving to deliver exceptional outcomes for our customers. Over the course of the 100 two-week sprints, we’ve achieved a lot. In total we’ve received over 604,000 new Carer’s Allowance claims and processed over 128,000 change of circumstances. Digital take-up of the service is regularly over 75% and customer satisfaction regularly exceeds 93%. Carer’s Allowance provides financial assistance for people who look after someone who needs to be cared for, so we’re proud that we’ve been able to make it simpler, clearer and faster for them to make a claim. And we’ve also made sure that the digital claims are quicker for DWP operational colleagues to process. We’re really passionate about the impact our service has on customers and their feedback really hits home how important our work is to society. One recent user said, “I don't think it could have been improved for me today. It was easy to understand, comprehensive and user friendly. I was able to access the application straight away and it gave me clear instructions and advice as to how to proceed. It corrected me when l went wrong and gave me advice about how l could correct myself. It gave me clear feedback and a clear idea of when l could expect a decision. It’s fair to say that the Carer’s Allowance Digital Service holds a special place in the hearts of all those who have worked on it. Over the course of the 100 sprints, we’ve had an evolving cast list and said hello and goodbye to a number of colleagues. But we’ve remained true to the original vision - to help carer’s get the money they’re entitled to quickly. The digital service gives users one less thing to worry about, at what is potentially a stressful time for them. And that’s what makes it all worthwhile. The team has shown true resilience and have pulled together to protect our exemplar service over the years. And we’re soon starting to look at end-to-end service transformation for Carer’s Allowance, looking at how we could build out from the existing digital service. The Workflow Assistance feature that we have built will be a real enabler for this, and has already been recognised and shortlisted for a National Technology Award. This gives us a real opportunity to consider the totality of the service, and be transformational; bringing real operational efficiencies and enhancing the customer experience even more. Watch this space for more news as we continue our journey! If you are interested in joining us visit our Digital Careers website and look at our LinkedIn page to see our latest jobs. Find out more about what's happening in DWP Digital: Subscribe to this blog or follow us on Twitter @DWPDigital.